Organic Much? Liquid Seaweed is a Great Start! One of the best things about using liquid seaweed is that it is safe for food, people, pets, lizards and beneficial insects. It is also so much safer for the environment than chemicals. Among the many available organic fertilizers now on the market, liquid seaweed extract is certainly one of the most beneficial. This is because it is not only a plant food, but it effectively works as a biostimulant (stimulates the biological process in plants and soil) and a soil conditioner as well. Yet, many gardeners still do not realize it’s values. Aside from being a proven fertilizer, this product is not just organic and natural, but that it comes from a sustainable source and its production is done without harming the environment. (Eco friendly Yeah!) It is also important to remember that unlike chemical fertilizers that can bind the soil and eventually render nutrients insoluble, Organic fertilizers aid in this process making our horrid central Texas soils more aerobic and friendlier to the Microbes that keep our soil healthy and working for us. Liquid seaweed passes through a scientific extraction process that is designed to maximize the derived amount of primary, secondary and trace elements, as well as the naturally occurring plant growth regulators and other beneficial compounds. It is non-fibrous and non-neutralized alkali extracted. Liquid Seaweed works on a wide variety of plants and works well with other organic products such as liquid compost and fish emulsion. In fact, many nurseries will alternate these products so they can fertilize weekly. Seaweed provides a wide range of beneficial effects that include providing a well-balanced nutrition, improved growth & development of plants, lawn and trees, increase resistance to biotic and abiotic stress, soil conditioning and increase in flower and leaf production. Liquid seaweed is the same seaweed species used to produce food supplements, food ingredients and enhancers, cosmetics etc., proving its being safe for environment and humans. This means it is safe for your veggie beds and herb gardens. 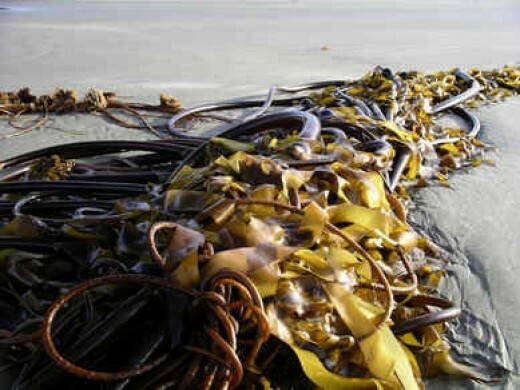 Edibles and perennials both benefit from liquid seaweed. that the plants need, making it an ideal supplement. It also contains carbohydrates and mannitol, a natural organic chelating agent. It is easily absorbed by the plants and it is great for both foliar and soil feeding. It stimulates the metabolic processes helping the plant to explore leaf-locked nutrients (it is known that trace elements from the soil to the leaf tissue may become immobilized there) The growth hormones in liquid seaweed boost the rate of seed germination, increases cell growth and stimulates more vigorous and stronger roots. It increases chlorophyll retention thereby enhancing photosynthesis (and adrressing the sallow look of nutrient deprived leaves). It also helps the reduction of premature fruit dropping, which means more fruit for you to enjoy. It is also said to increase the shelf life of the fruit if used on the tree within 10 days before picking. Liquid seaweed also effectively improves soil condition and improves the absorption of nutrients from the soil. Maxicrop is one of many great products that has many of the same properties. This is the product that I use most often and aside from the above information, it also protects your plants in the winter and scorching Texas summers from cellular damage. Follow the instructions carefully and you will have tremendous success with this product. Aside from compost, this is one of the only fertilizer’s I use. 1. Used as a rooting solution for cuttings, liquid seaweed promotes the development of roots giving cuttings a great chance at success. 4. When applied as a foliar spray to flowers or fruiting plants a day or two before cutting, liquid seaweed may extend the shelf life. 5. The solution provides natural hormones and nutrients that are immediately absorbed through the leaves. 6. During drought and periods of stress, general use will encourage betaines (neutral chemical compound in plants) that assist osmosis in plants and help them increase the uptake of nutrients and proteins that will help the plants survive in stressful situations. 7. Liquid seaweed concentrate contains starches called alginates that act like sponges. These alginates hold and supply water droplets near a plants root system providing moisture to the plants. ← Find Me on Facebook! I bought this Maxicrop at Lowe’s last week and have used it on my container, landscape plants that looked stressed, and house plants. Even used on my office plants!